Ever notice how the steampunk versions of things are wildly impractical? I realize that plenty of people get excited about this stuff, ’cause, hey… Gears! And shiny brass! And shiny brass gears! His base body was Air Strike Wolverine with Loki legs, Lex Luthor right hand, Medieval spawn left hand, X3 Juggernaut feet, and a DC Direct Dr Midnight head. Really, though? With the shield? Yes, it’s very pretty, but what is it intended to deflect? Gentle breezes? Ambient lighting? Common sense? To his credit, though, I’d rather watch a movie about a steampunk Captain America trying to fight crime while hoisting a 75-pound shield made of gears than some flick about boring, ol’ regular Captain America. 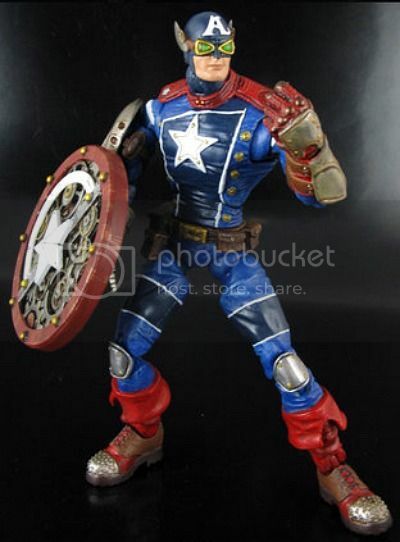 Bid on Steampunk Captain America and check out Jin’s other custom figures. I like it until I focus in on his atrophied groinal region, then I stare at it until I feel vertigo. i don’t know where people got this idea, but hotgluing a bunch of spurious, fatuous gears to whatever-it-is does not necessarily make it OMG AWESOME STEAMPUNK WORTH $2000 ON ETSY.